Metropolitan Water District of Southern California, the Water Authority’s largest supplier, obtains its water from the Colorado River and the California State Water Project (SWP). The SWP is owned by the State of California and operated by the California Department of Water Resources. The Harvey O. Banks pumping plant pumps water south from the Bay Area to 25 million Californians in communities to San Diego through the State Water Project. The project stretches more than 700 miles, from Lake Oroville in the north to Lake Perris in the south. Water is stored at Lake Oroville and released when needed into the Feather River, which flows into the Sacramento River and to the Sacramento-San Joaquin River Delta. In the north Bay-Delta, water is pumped into the North Bay Aqueduct for delivery to Napa and Solano counties. 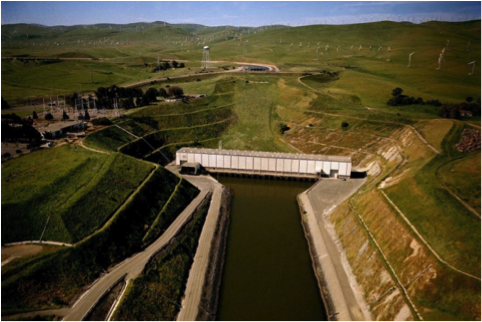 In the south Bay-Delta, SWP pumps lift water into the 444-mile-long California Aqueduct. Some water flows into the South Bay Aqueduct, to serve areas in Alameda and Santa Clara counties. The remainder flows southward to cities and farms in central and southern California. In the winter, when demands are lower, water is stored at the San Luis Reservoir located south of the Bay-Delta. The SWP terminates at Lake Perris where it joins MWD's system.